6.31 acres of air rights located over Quincy Center Station and its’ surroundings. The Massachusetts Bay Transportation Authority (MBTA) recently issued a Request for Proposals (RFP) for development of the air rights, which include the area above Quincy Center Station and the Red Line/Commuter Rail right-of-way between Dimock Street (to the north) and 194 Burgin Parkway (to the south), as well as the land on which the Quincy Center Bus Terminal is located. A condemned five-story parking garage currently stands above Quincy Center Station. The MBTA's RFP comes at a time when Quincy Center is seeing significant investment. The $60 million West of Chestnut development, featuring 169 apartment residences and multiple ground-floor retail options, was recently completed, and the $30 million Nova Residences of Quincy, featuring 171 apartment residences and over 15,000 square feet of commercial space, recently broke ground. Chestnut Place, a 15-story tower pegged at $45 million featuring featuring 124 apartment residences and 4,000 square feet of retail, is anticipated to break ground by the end of 2017. Just outside Quincy Center, Deco, a $36 million recently completed apartment building featuring 180 residences, was sold to TA Realty last April for $68.5 million, or $380,556 per residence. Based upon area comparisons, Class A apartment rental rates in and around Quincy Center average $3.25 per square foot, and Class A direct average asking rent for office space has reached $24.53 per square foot. City infrastructure projects totaling over $400 million have been recently completed or are underway in and around Quincy Center. Demolition of the Quincy Center MBTA parking garage continues. The garage has not been used since 2012 but will be the future site of a transit-oriented mixed-use development. The planned development at the 6.3-acre site will consist of 300 apartments on the lot in front of the station, followed by more apartments or commercial space on top of the station in place of the former garage. Additional plans call for an office building over the tracks adjacent to the stop. Atlantic Development and Bozzuto Development’s proposed 6.31-acre air rights development over Quincy Center Station will advance, though proposed apartments have been cut to 300 from over 600 as originally proposed. While the Massachusetts Bay Transportation Authority (MBTA) approved Atlantic and Bozzuto’s original plan for over 600 apartments and 225,000 square feet of commercial space, the Quincy City Council subsequently approved the MBTA’s development agreement with the proponents providing the apartment count would be halved. Area residents had also opposed the larger proposal. Atlantic, Bozzuto and the MBTA plan to spend the next six months developing a formal development plan to present to the City of Quincy’s permitting bodies. The first phase of the proposed air rights development is expected to open in 2023. Atlantic and Bozzuto will pay the MBTA $167 million over a 99-year lease in order to construct the development; a second air rights proposal received by the MBTA would have paid a $6.3 million lump sum and constructed 326 apartments, 13,200 square feet of retail and 14,500 square feet of office space. Atlantic and Bozzuto are also the proponents of a transit-oriented development at the North Quincy MBTA station that will break ground in the second quarter of 2018. The Massachusetts Bay Transportation Authority (MBTA) has received two bids to develop 6.31 acres of air rights over Quincy Center Station, and is recommending the selection of a proposal to construct over 600 apartments in addition to 225,000 square feet of commercial space. The development would be constructed by a joint venture of Hingham-based Atlantic Development and Bozzuto Development of Maryland, who are also the proponents of a transit-oriented development at the North Quincy MBTA station that will break ground in the second quarter of 2018. The MBTA’s Fiscal and Management Control Board will formally vote on the Quincy Center proposal in an upcoming meeting. The proposed project would be completed in three phases, starting with $20 million in station and infrastructure upgrades, 300 apartment residences, retail space and about 250 parking spaces that would open in 2023. Phase Two would involve replacing the top three floors of the existing, shuttered station parking garage with 300 additional apartments and 365 parking spaces, which would open in 2027. Phase Three, opening in 2031, would construct a 225,000-square-foot office building and potentially additional parking atop the MBTA rail right-of-way. At least 10% of apartments would be designated affordable. Atlantic and Bozzuto would pay the MBTA $167 million over a 99-year lease in order to construct the development. An initial $34 million payment would be made for the project’s first phase. A second air rights development proposal received by the MBTA from JAG Northeast Development of Virginia would pay a $6.3 million lump sum and construct 326 apartments, 13,200 square feet of retail and 14,500 square feet of office space, in addition to 324 parking spots. The Massachusetts Bay Transportation Authority (MBTA) has issued a Request for Interest (RFI) for development of 6.31 acres of air rights located over Quincy Center Station and its’ surroundings. The MBTA is looking to enter a 99-year lease of the air rights with a qualified developer. If there is sufficient development interest, then the MBTA will issue a formal Request for Proposals (RFP) and work with the City of Quincy to designate a developer. Any development would presumably require total demolition of a condemned parking garage which currently stands above Quincy Center Station. The top three floors of the five-story garage are scheduled to be demolished over 18 months starting this Fall. 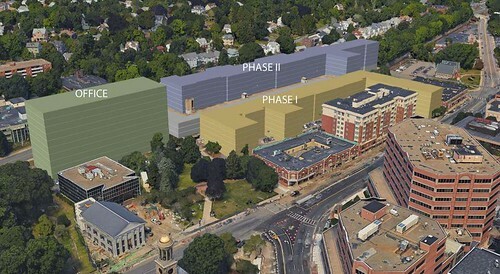 A site tour of Quincy Center Station for interested developers is scheduled for next Wednesday, July 19th at 12 PM; the Request for Interest (RFI) response is due Monday, July 31st at 12 PM. If issued, the official Request for Proposals (RFP) for the air rights will be released Monday, August 14th, with proposals due Monday, September 25th.